I just finished putting sleeves on two new pieces and wondering to myself whether or not they are completely done. 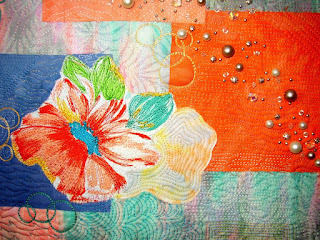 The thing about getting into embellishing your work is that you can continue to add stuff and add stuff and add stuff. When is enough enough you might ask? I usually just hang the piece up and look at it for awhile. If I like it every time I walk by or glance at it, then it is done. If it nags at me that something isn't quite right then I start to consider what can be couched, beaded, or painted/stamped on top of it. Yes, my quilts talk to me. I listen to them to find out what they want to be and I try to take them there. I use my best creative effort to make them something that I would like to see hanging on a wall--or, ultimately, what someone else would like to see hanging on their wall! My mom and I were talking about how difficult it is when you are working on a piece this size with a good amount of effort already invested in it, to experiment with techniques or ideas that are untested or new to you, or just risky (such as doing cutouts which I have done before but that are definitely a "there's no going back" thing to do!). This piece is currently about 53" tall and 32" wide which is rather large for me. It is much easier to take risks on a smaller piece that you haven't put so much into and that if it doesn't turn out you haven't lost as much time and materials as with this size of a piece. I think I will be doing some smaller pieces in the very near future as this one is monopolizing way too much of my time just sitting there and not telling me what to do with it! It has potential and I love the colors/fabrics. I'm starting to lean towards just layering it and quilt it already, then decide how to embellish further. 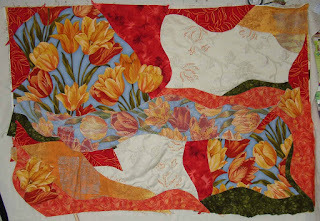 Sometimes the quilting just flows out and helps to complete the piece. It will stay up on the wall today for further pondering and tomorrow I will decide whether to embellish or quilt. Speak to me! The project we worked on this month and shared yesterday was Pin Weaving using a foam core board and pins to hold the warp and a tongue depressor to hold the warp threads apart for weaving. It is a great way to use all of those fun and funky yarns and trim pieces that you just had to buy but don't know what to do with! I particularly like the fuzzy, hairy, and slubby yarns for great texture and combining them with silk ribbon---beautiful! We also did weaving of two (or more) different fabrics cut into strips which creates a very usable piece for backgrounds or whatever. I haven't done anything yet with the piece I made from fabric strips, but my effort at pin weaving became part of a somewhat sophisticated looking wall hanging with couched fibers and beads. 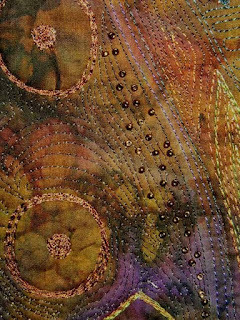 I used the couched yarns and ribbon to echo the lines of the pin weaving. I spent a long time with the piece up on my design wall trying to determine placement of the beads. I use long quilting pins to try to pin the beads up so I can stand back and evaluate it. I have a hard time laying the piece on a table or the floor to evaluate this since the perspective is not quite right. I have done that and stood on a chair to try to evaluate, but if I can pin them on my design wall it seems to work better for me. I must have moved them around 30 times before I was happy with the balance and design. I started with the red beads and some other beads that I did not end up using. I had just purchased the bone beads this weekend and I thought they worked well for the piece. Last week my mom and I made a trip into Missoula (1/2 hour north of us) to visit a couple of galleries and hopefully make some appointments to show them some of my work. The first place we stopped was Whooping Crones Gallery and the owner said she had time and wondered if I had brought any with me. Being rather an optimistic person and always wanting to be prepared for an opportunity, I had conveniently placed a number of my works in the back of my car. I brought them in and she was very interested and will be showing several of them in her gallery for the month of January! I was so excited at this positive reception of my work and her interest in having fiber works in her gallery. Currently there is a show hanging in the Gallery for the month of November and December of works done by members of the Surface Design Association which are wonderful and worth seeing. I am honored to follow them and have my work shown in a gallery that is displaying fiber art in such a respectful and professional way. If you are in the area, please visit the gallery at 508 E. Broadway (across from the Children's Theatre building). I believe my works will be hanging from First Friday until the end of January. Oh yeah, I almost forgot! 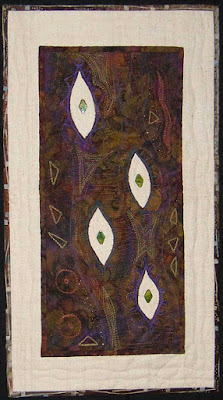 Check out the Studio Art Quilt Associates auction on www.saqa.com. I have donated a piece on page 2b that is up for auction right now called "Birds of a Feather" (see it at the bottom of my blog), but there are many other wonderful pieces. This is a reverse auction where the pieces start at $750 and go down each day until they get to $75. This week I had my first trunk show for a small group of quilters (about 35) in the nearby city of Missoula, Montana. 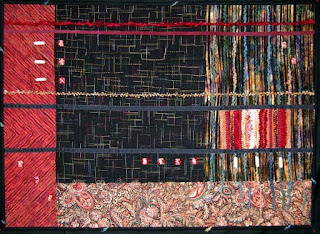 I showed just over 30 of my early and current art quilts and talked a little bit about the techniques and development of them. My mother graciously assisted me by holding up the quilts and walking them around the semi-circle so everyone could see the quilting and embellishment on them. 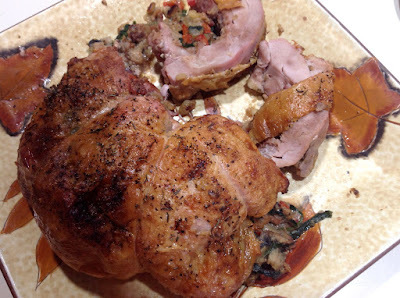 It appeared that they really enjoyed them and they had some great questions for me. I felt very good about the experience and would look forward to doing it for other groups in the future. Tonight I will be half of the program for our local quilt group talking to them about using threads and other fibers to enhance and embellish quilts. I'm certainly no thread expert, but I have tried many things and experimented so hopefully I have some hints and tips that might be useful to other quilters. The other half of the program is a woman who does a lot of beading. I have only recently started beading on my quilts so don't feel qualified yet to give advice in that area, but I'm looking forward to seeing what she has to say and show! 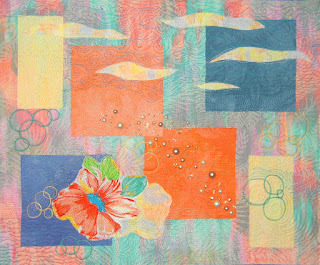 I'm planning to show a few of my quilts that illustrate how I have used various threads and other ways of using fibers such as couching, thread painting, hand embroidery, and sashiko stitching. My husband came home last night from hunting out of town with two mule deer does and a buck in the truck so today we are cutting and wrapping venison for the freezer. I have a short break here while he trims and cuts some steaks for me to wrap, but I'm sure he'll be calling me at any moment to get back to work! 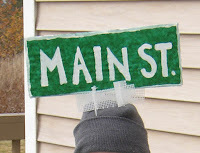 My six year old was decked out as a street sign last night which was so simple to make and such a hit! He wore a knit hat with the sign on it, gray sweat pants and sweat shirt, gray gloves, gray socks. He was a little embarrassed (six year olds usually go in for superheroes), but all the good comments made him a bit more proud of what mom had made him into. I can remember a particularly embarrassing costume that I wore in grade school. It was probably due to reminding my mom the day before that I needed a costume so I had to wear whatever she came up with. It was the Emperor's New Clothes and I had on long underwear and a purple cape. I would rather have been a street sign! Usually my goal with my son's costumes is to make them comfortable so he won't mind wearing them all evening and cute enough that we get some good pictures for the scrapbook. In past years he has been dressed as Ferdinand the Bull (from a popular children's story) and a bottle of ketchup (very cute). This year's was definitely the easiest. Now to change the subject, I thought I would show you some of my recent finished art pieces so you can see more of what kind of work I do. Sometimes the works in progress are so rough you can't see where they are going or how they might end up and I'd like to let you know that they do eventually turn into something! The first one arose from experimenting with melting synthetic fabrics with a heat tool and is called "It's A Scorcher". Various fabric scraps of different times from lame to acrylic felt were layered and then covered with organza. I stitched the layers to hold them together, then I randomly melted areas with the heat tool. I sliced the piece in three units and attached it to a background then embellished with twisted wire, long bugle beads and couched yarn. 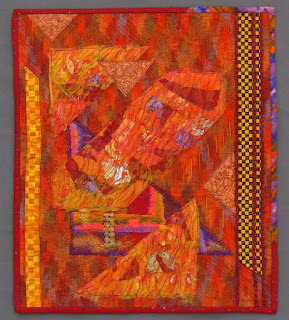 The picture is not the greatest mostly I think because of the bright oranges in the fabric, but you get the idea. The second piece is called "Out My Window" and in it I used some photo transfers on silk (left) and organza (right) portraying some cottonwood trees in my backyard. I embellished with some beads, a touch of embroidery, and stamping. 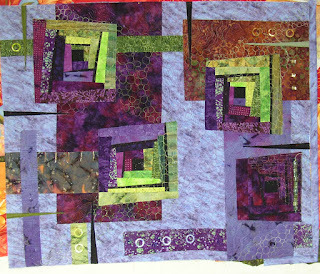 I love the boldness of this quilt created by using just three colors. 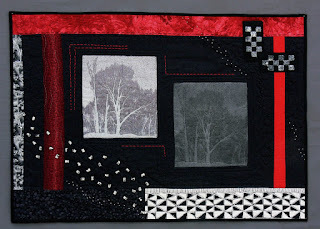 It was made for our local quilt show that was in July with the theme of "In My Backyard". Didn't win any ribbons, but I like it. I have a few quilts done more recently that my dad just helped me take pictures of and I'll try to get a couple of those up here for you to see once I get them onto my computer. It would be nice to get some comments on my work and please let me know what you would like to see or hear about. But even if you don't wish to comment, please do visit again! I started on a new piece and it is going well I think. 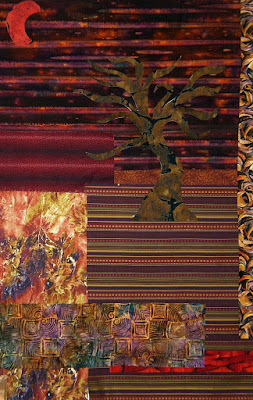 I really like the colors, although the fabric I used for the tree might be a bit dark. I'll work with it though because I don't like the fusing and cutting out so I'd rather not do it again. Quilting and beading can improve a myriad of problems and design flaws! This piece will have some leaves dangling from the tree branches on strings of seed beads and I think one will also dangle from the moon. That decision will be finalized later after I get the background together and the tree on. I'm trying to decide how much, if any, of the background to actually piece together versus my usual method of machine appliquing the fabrics onto a backing fabric. I'm thinking possibly a combination of the two might work. Note that this piece is cropped somewhat so that you don't see the clutter on my design wall and around the piece. The red moon is actually set into the quilt surface a bit more than it appears. My original sketch of this design has curved background pieces simulating a landscape and another sketch idea has the hills strip pieced from the various fabrics and then cut out and appliqued to the piece so each layer of the landscape has multiple fabrics in it. With the fabrics I'm using I think the strip pieced option might be too busy. I'm leaning toward the current straight line background right now but trying to decide whether to curve them like hills before I attach them. It's not stitched down yet so I can still change my mind! I definitely work much quicker on a piece when I can somewhat visualize the end result as I can on this one. Since I know I want to have dangling leaves and some beading I can see in my mind how it might look when it is done. At this stage it is quite simplistic, but by the end with the embellishment and quilting I think it will be a very intriguing and wonderful piece. More to come….! Yesterday I attended a workshop on threadwork and had a good time playing around all day. We did couching, thread painting, calligraphy with thread, and other techniques. It was good to create samples of all of these options for future reference when I can't think of what to do for a piece. One technique that created some interesting results was using highly contrasting threads in the bobbin and top and then increasing the top tension to around 6 to cause the bobbin thread to come up and create an interesting look on surface of the fabric. I used a black fabric, red upper thread and green in the bobbin. The spiral design I made looked very similar to a strawberry (red with little green dots for seeds)! The flower below was done over a very simplified crayon drawing. The tree is just a little postcard done freehand/freemotion. I'm ready to begin something new and continue to ignore the large tulip piece for a while. I'm thinking of taking it down so I don't have to look at it for a while and then coming back to it later. Maybe in the meantime an idea will come to me. It happens. I'll hope for the best. At least I'll be able to move on and be a little productive! My mom is also a quilter and obviously where I get any talent I might have and certainly my inspiration. We have both purchased some of the same fabric and are challenging ourselves to create pieces featuring it. Hers is well on its way but so far mine is nothing but a pile of fabrics. I love the fabrics I've chosen but nothing has come to me as how to use them. I think I'll have to go back through my sketch/idea notebook and see if I come across anything in there that triggers a design. Keeping that notebook has been a valuable resource for me and lets me never forget an idea no matter how incomplete a thought it might be or how unattainable it might seem at the time. You never know where the next great artwork idea will come from and sometimes they blossom from what you thought you'd probably never see come to fruition. So I write everything down. And sometimes it works for me. Serendipity. This is my first post and I'm new to blogging, so bear with me! 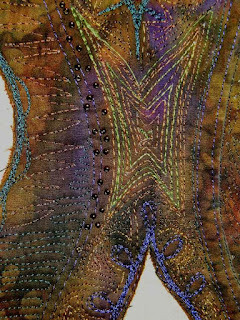 I want you to see what I'm doing in the fiber art world so keep reading! I've been stymied by one piece I'm working on (see above) and now I have some prior commitments to attend to outside the studio, so I guess it will remain undone on my design wall until I can be inspired to return to it. It is a bold and colorful quilt that is much different than my usual---although I'm not sure I have a "usual" style! It is also larger than most of my recent pieces and it seems to be a difficult size for me. It is hard sometimes for me to show people my works in progress as they are quite rough compared to what they will eventually become. Unfortunately I don't have a clear vision of this one and how it will look, but you can get an idea of the lines and bold color. I definitely have some work in front of me to tie this together and balance it out. It will come, it will come....! 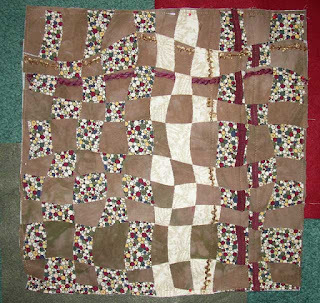 I have just finished a piece (picture of it below before it was completely done) that is based on the log cabin pattern but has modern twist to the piecing and color. I love how the colors (purple and lime) play in this one and I'm really happy with how the embellishments worked out. It was a stubborn quilt when it came to actually quilting it and I had to put it aside for several weeks. My machine kept skipping stitches and breaking the thread constantly. I finally picked it up again last week and zipped right along with the quilting with very few problems, even using metallic threads. I had planned to enter it in a show but that deadline passed and I guess it just wasn't meant to be. It just did not want to be done for that one! I'm sure something else will come along for it. I will be showing it at a trunk show on November 5 along with many of my other art pieces. My goal these days is to sell my quilts so I'm trying to get them out there for everyone to see and let people know about what I am doing. I'll try to get some more pictures onto my blog so you can see the work I've been doing. 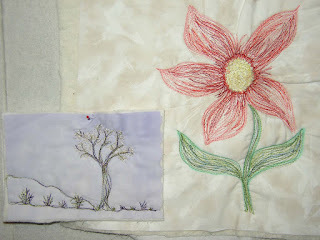 Right now I need to get ready for my quilt guild meeting tomorrow night so come back again later to see what I'm up to!